A major agricultural concern is the control of a broad range of pests that can attack crops and have a devastating impact on the quality and overall yield. For agricultural food products, supplying the consumer with a product that is not only of high quality, but is safe for consumption, is of the highest priority as well. One alternative to broadcast spraying of insecticides directly onto crops is to lure insects into a trap or onto an insecticide-treated surface. This reduces or eliminates the need to treat the crops directly. The luring agent is a pheromone, a chemical naturally emitted by insects, as well as other animals, which influences their mating process. Once entering the trap or on the treated surface, the presence of an insecticide will eliminate the pest permanently. In addition to commercial agriculture, pheromone insect traps used to eliminate moths, roaches and ants are available for consumer use as well. Most often, these consumer products are used in kitchens and food preparation areas. In these environments, pheromone traps may substitute an adhesive surface to trap insects rather and a pesticide. The PDS-100 Programmable Dispenser manufactured by Fluid Metering, Inc. (FMI), is the answer to precision production dispensing of both pheromones and pesticides. 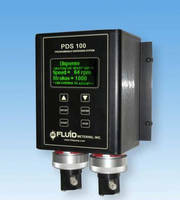 Available in both single and dual channel configurations, the PDS-100 will dispense one or both chemicals simultaneously. Since both channels are independently adjustable, dual dispensing models will precisely dispense both pheromone and insecticide in infinitely proportional ratios. However, the key to the precision and accuracy of the PDS-100 Programmable Dispenser lies in its unique valveless piston principle. The pump utilizes only one moving part, a uniquely designed ceramic piston, to accomplish both the pumping and valveless functions within the pump. The PDS-100 will dispense pheromones and insecticides for millions of cycles at 0.5% precision without the need for recalibration paying for itself in a relatively short amount of time. For over 55 years Fluid Metering pumps have been used in chemical, pharmaceutical, food, fuel cell alternative energy, water treatment, filtration, environmental monitoring, food processing and much more. For additional information, Call toll free 1-800-223-3388 or 1-516-922-6050, FAX 1-516-624-8261, email: pumps@fmipump.com or visit our website at www.fmipump.com which now features “Live Help”, an online direct connection to FMI’s application experts.